Avian Flu Diary: JAMA: Yellow Fever - A New Global Health Emergency? JAMA: Yellow Fever - A New Global Health Emergency? We've been following the Yellow Fever (YF) outbreak in Africa now since early February, starting in Angola and then moving into the DRC a month later. Uganda, meanwhile, is dealing with a separate Yellow Fever outbreak, not epidemiologically linked to the DRC or Angola outbreak. With an incubation period of 3 to 6 days (cite CDC's Yellow Book), and a high number of unvaccinated international travelers, we've seen exported cases turn up in both China and Kenya. The ECDC's assessment on the The Risk Of International Spread warned of greater international spread of Yellow Fever, and while the risks to most of Europe are considered low, the same cannot be said for other parts of the world where competent vectors (Aedes mosquitoes) are more common. Follow the link to read the article in its entirety. The WHO should urgently convene an emergency committee to mobilize funds, coordinate an international response, and spearhead a surge in vaccine production. 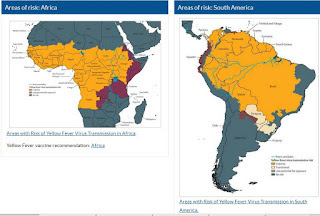 Prior delays by the WHO in convening emergency committees for the Ebola virus, and possibly the ongoing Zika epidemic, cost lives and should not be repeated.3 Acting proactively to address the evolving yellow fever epidemic is imperative.